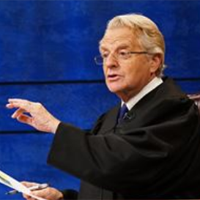 The news that Springer is headed back to daytime television comes six months after The Jerry Springer Show was canceled after a 27-year run. Springer is expected to return to many of the same stations that hosted his syndicated show. NBCUniversal has sold Judge Jerry to stations covering 75% of U.S. TV households. "For the first time in my life, I am going to be called honorable," said Springer, who earned his J.D. degree from Northwestern University and previously worked as a lawyer. "My career is coming full circle, and I finally get to put my law degree to use after all these years." NBCUniversal said Judge Jerry will be a traditional court show, in which Springer will “render a verdict with a fair yet firm hand and always leave litigants with a dose of classic Springer wisdom.” New York Post first reported plans for Judge Jerry last month. Variety said the new show is "an effort to NBCUniversal to capitalize on Springer’s popularity in a new format that may not be as much of a turn-off to major advertisers."